A brief guide for nonprofits looking to implement or transition a content management system. One of the most important components of a successful nonprofit organization is a functional, up-to-date website. Not only does a site provide an online presence, but it also provides a channel through which constituents can donate, share and participate. One of the most difficult problems for any organization looking to create a web presence is figuring out which site manager, or content management system, they’re going to use. There are literally thousands of options on the market, and each offers very specific functionality. Luckily enough, nonprofits typically have more specific needs than other organizations looking for web sites. 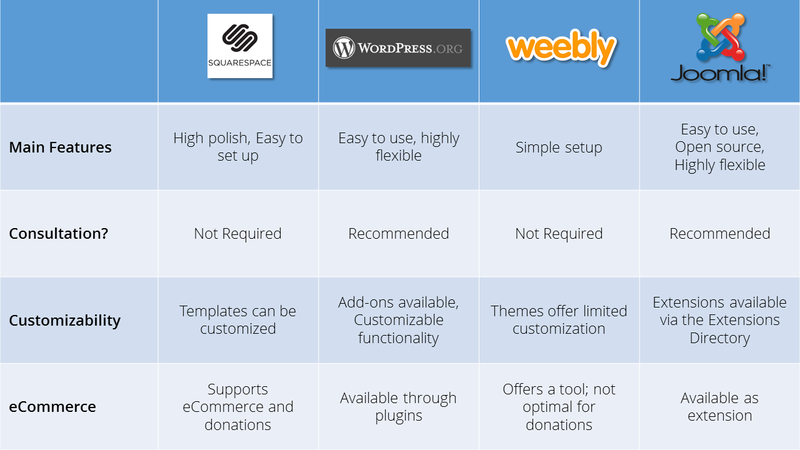 The following is a visual guide to choosing a content management solution for your nonprofit, and will serve as a helpful primer for those new to the CMS ecosystem. The first thing to know when first approaching a CMS is that typically, a site’s cost will scale in proportion with its customizability, complexity, and outside integrations. If you want a multi-authored, responsive, thousand-page website with the capacity to accept millions of dollars of donations, it’ll probably cost you a bit more to build the backend. That being said, it’s totally possible to have a small site that isn’t very complex, doesn’t offer custom options, and still looks great on its own. There are a couple things to note when you approach your own site this way: First off, this method does not scale very well. If, sometime down the road, you decide that you want to accept donations through your Weebly site, you probably won’t find the support you need and will probably have to rebuild from the ground-up. Think of the following recommendations as specialized containers: They will serve very little purpose beyond creating an online presence, and are not a long-term solution for nonprofits who want to do big things through the internet. If you don’t need your website to do any heavy content or data lifting, and are only planning on using it to establish a presence, then the following options will probably be well-suited to your needs. Whether you’re a larger-sized nonprofit or a smaller nonprofit with large-scale online ambitions, you’re going to want a CMS with deep customizability and scaling options. All of the below solutions offer a deep set of custom options, and can carry out the most popular nonprofit functions with add-ons or other extensions. If you’re looking for software which caters specifically to the needs of nonprofits, you might want to give Blackbaud’s NetCommunity CMS some thought. Blackbaud is currently one of the major players in the industry, and their software has achieved widespread popularity for its nonprofit specializations. If your organization is already using Blackbaud’s ever-popular Raiser’s Edge CRM software, you may want to try its NetCommunity CMS, which directly integrates with Raiser’s Edge. 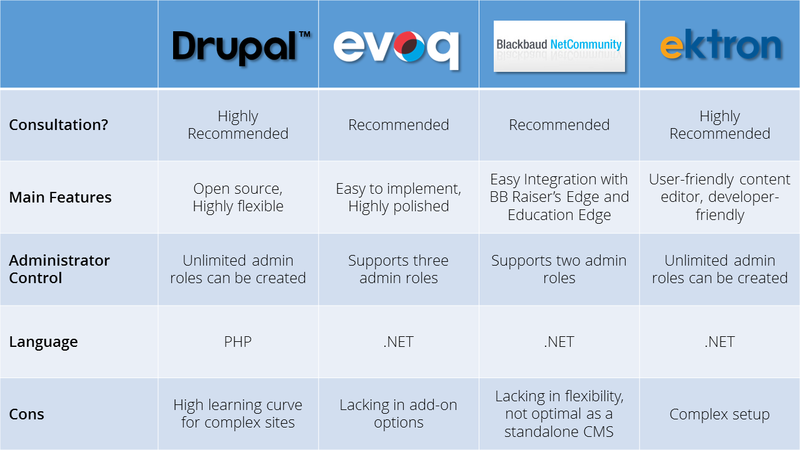 If you’re looking for something more open and flexible, Drupal is a fantastic open source solution. Not only is it free, but it’s so ubiquitous that other major platforms—like the government-friendly OpenPublic CMS—have used Drupal as their base. For all of the below options, we recommend that you consult with a web developer or other IT professional to set up your site on your behalf.